To teach the fundamentals of sport in a fun atmosphere, instilling the importance of teamwork and self-confidence. One-on-One Basketball Clinic – 30th Year Tradition! For more details and to register for the 2019 Best of the Best Fall Showcase, click HERE. 30th Year Tradition – One week only! Register for 2019 One-on-One Basketball Clinic – 30th Year! Kim Penney, founder of One-on-One College Consulting, was the girls varsity basketball coach at Reading Memorial High School from 1998-2013. 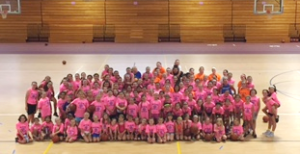 Coach Penney has directed girls basketball clinics for 20 years in various towns on the north shore, including the Annual Reading Girls Basketball Clinic (now known as One-on-One Basketball Clinic), which will celebrate its 30th year in summer 2019! While capturing five consecutive Middlesex League titles at Reading, Coach Penney’s 2012 Reading team went undefeated (25-0) to win the school’s first Division II MIAA Girls Basketball State Championship. She was selected as Boston Globe Coach of the Year and was inducted into the Reading Memorial High School Hall of Fame in 2015. Many of her former players have played Division I, II and III college basketball and now coach at the youth, high school and college levels. Jaclyn Lyons, basketball skills coach and event manager at One-on-One, was a stand-out player at Reading Memorial High School and attended UNH and Merrimack on a basketball athletic scholarship. She is currently the girls’ varsity head coach at Milton Academy. Coach Lyons helps manage all our One-on-One Basketball Clinics, which are offered throughout the year for elementary, middle and high school girls who want to improve their game. Ed Leyden, head women’s basketball coach at Suffolk University, founded the Annual Reading Girls Basketball Clinic in 1989. Participants of the Reading Basketball Clinic (now known as One-on-One Basketball Clinic) have gone on to play at every college level, including: University of Richmond, Assumption College, Bentley University, University of Hartford, UNH, Merrimack, Vassar, Saint Anselm, Simmons, Bates, Suffolk, Colby-Sawyer, and many more. 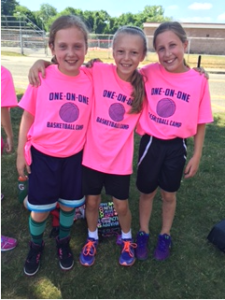 One-on-One Basketball Clinics are well-run and lots of fun. We were blown away by what the girls learned every day. They had an awesome time AGAIN this year!